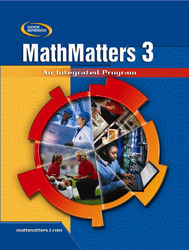 Help every student in your class with MathMatters 1-3. This alternate basal/intervention high school integrated mathematics series covers Algebra 1, Geometry, and introductory Algebra 2 content. Chapter themes and a wealth of career, consumer, and technical applications are an integral part of the program. Each title may be adopted separately or used as your three-year solution to the struggling math student. Build student confidence with frequent reviews and assessment.